There is really nothing like the imagination of a preschool-age child! Long before they can write their own stories, children are ready and eager to tell their own stories. 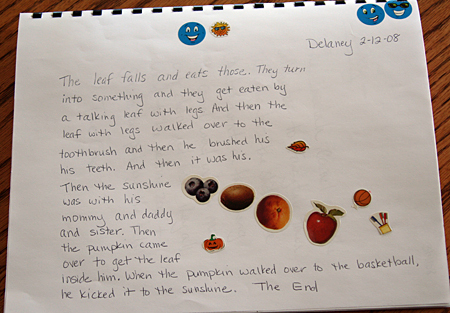 It is wonderfully empowering for a child to see her words written down as a “real” story. So, what are you waiting for? Grab some paper and get started! 1. Mystery Box (or Bag) – Put 3 or 4 objects in a box. You can choose anything from around the house, such as a spoon, a stuffed animal, a toy car, a pencil, a pine cone, etc. Let your child discover and talk about the mystery items – then see if she is interested in creating a story! This was always a popular activity at my daughters’ preschool – the sillier the item combination, the better! 2. Sticker Stories – Stickers can be great inspiration, too. 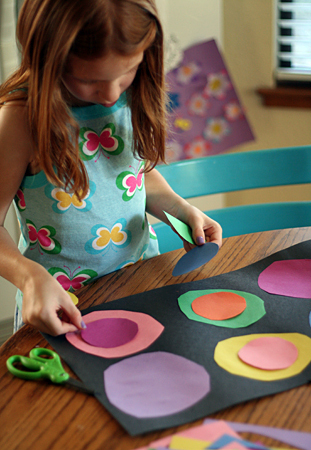 Decorate a paper with stickers and drawings, then write down what your child says as he tells you about his creation! 3. 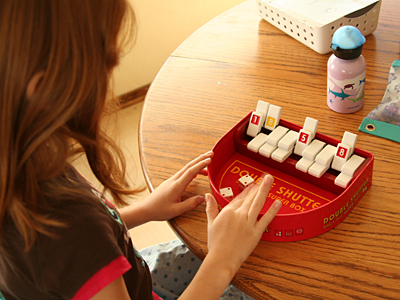 Playtime Stories – The next time your child is building a block structure or playing with her animals, sit down next to her with your paper and clipboard. Ask her to tell you about what she is playing. This is often a great way to record some of the pretend dialogue that your child makes up when playing. So precious to go back and read as they get older! Add a photo of the play session, too. 4. What Do You Think is Happening? – Next time you are finished with a magazine, pull out a few pictures or advertisements that might interest your child. Let your child choose one or two, and ask him questions like, “What do you think that person is doing?” or “What do you think might happen next?” Write down his story, then glue the pictures with the words, or make your own illustrations. She chose four cards from the deck, sequenced them the way she wanted, then dictated her story to me. Add some illustrations, and you’re done! 5. 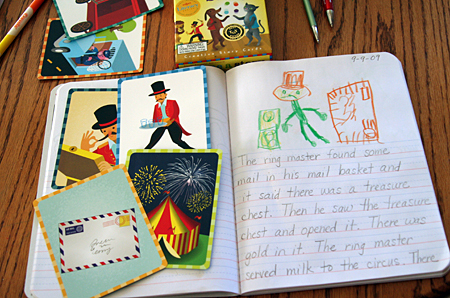 Create a Scrapbook or Photo Journal – Personal experiences are, of course, the most meaningful inspiration for stories. Nature walks, family vacations, birthday parties, and special activities are fun things to talk and write about. This can be as simple as gluing a photo to a piece of paper, then writing down your child’s thoughts and memories about it. Even something simple as watching the garbage truck can turn into a great narration! Keep a clipboard, paper, and pen handy so you can capture stories and narrations when the mood strikes. Start a binder to collect your child’s stories – as each story is written and illustrated, pop it in a sheet protector and add it to the binder. Don’t forget the date! This could become the most popular bedtime story in your house! Even when your kids start writing on their own, keep offering to take dictations. 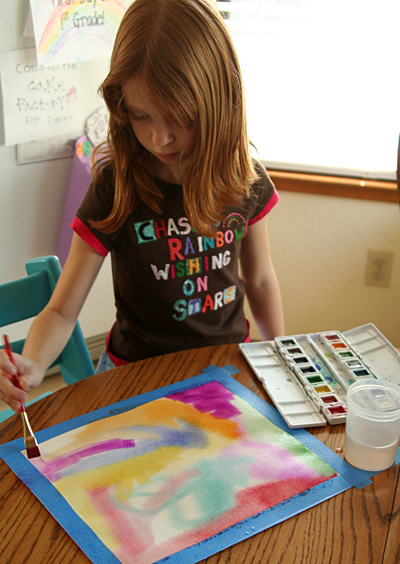 It takes a while for the writing ability to catch-up to the stream of creative thoughts in your child’s head! Have fun capturing those sweet stories and memories! After a recent trip to the art museum, my girls have been really interested in learning more about abstract art styles. 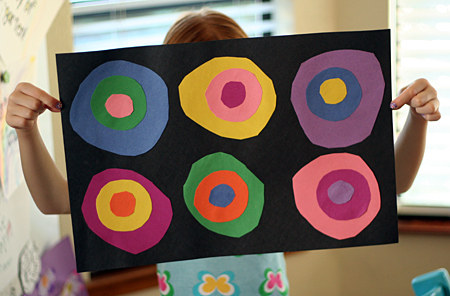 They tend to look at the abstract pieces – composed of shapes, blocks of colors, and lines – and think, “I could make something like that!” I found this simple Kadinsky Circles project at Deep Space Sparkle and knew the girls would love it! Time to create! This project basically involves tracing or drawing circles in three (or more) sizes, cutting them out, then pasting and layering them onto black paper. We talked a bit about contrasting colors, and the girls actually spent a lot of time laying out their designs to see what looked the best to them. 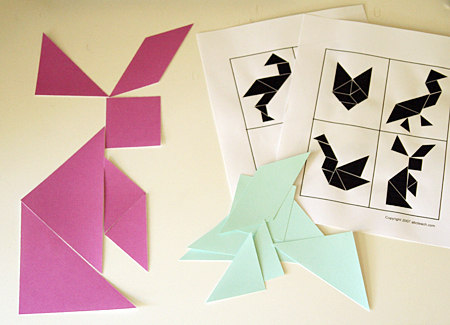 This project had just enough scissor work to be good practice for my five-year-old, without her getting too tired or frustrated. I love how the finished products turned out! 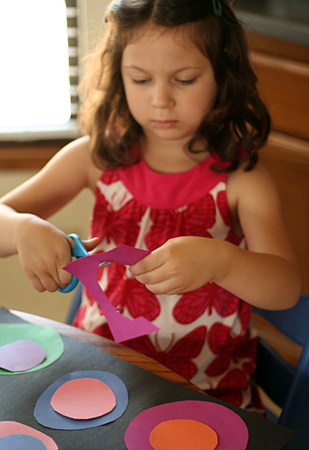 Tip of the day: Working with scissors helps strengthen the muscles used for writing – practice, practice, practice! She wanted to write down all the words she was sounding out, so I made her this simple recording sheet. I put it inside a sheet protector so we can use it over and over again. 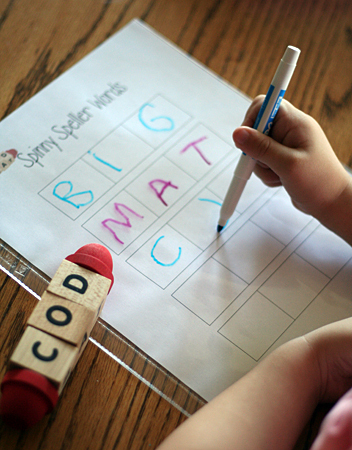 If you would like to print one to go with your Spinny Speller, here you go! 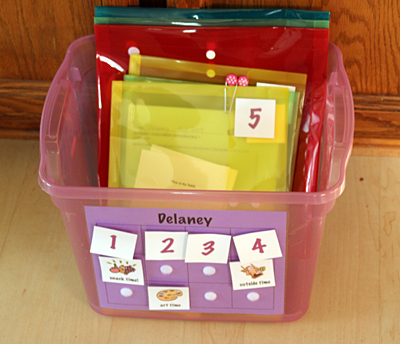 Delaney’s Workbox: We are using our own version of Sue Patrick’s Workbox System – more details coming soon on how we’re using this system! If your child can’t come up with the answer, give her the first word and see if she can complete the rhyme. Can you think of your own hink pinks? Could you think of a hinkity pinkity with a 3-syllable rhyming answer? It would be fun to try! 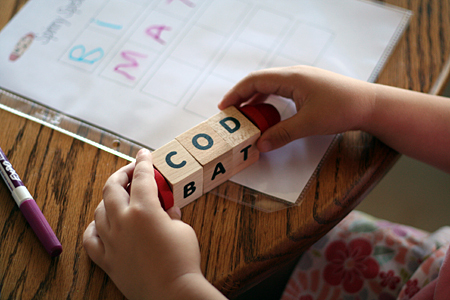 Playing with rhymes is a great way to build phonemic awareness – the knowledge of how spoken language works. 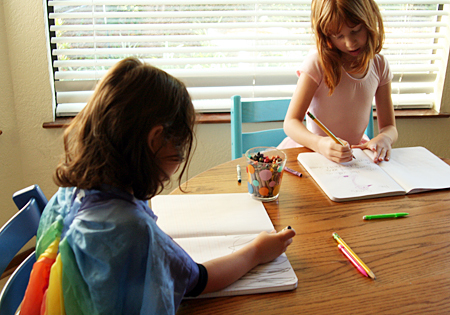 We’re going to make our own book of hink pinks – they are fun to illustrate! The teacher books are getting pulled out and dusted off, but the teaching will be much closer to home this time. After much thought (and sleepness nights), we have decided to homeschool the girls for Kindergarten and 1st Grade this year. 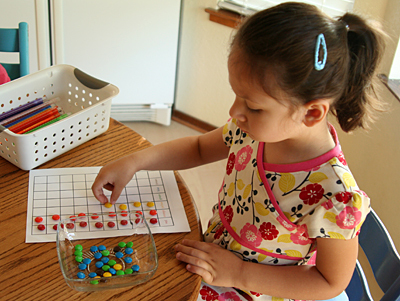 I am feeling excited and overwhelmed, but I know that much of what we already do to learn through play will carry-over just fine into our homeschooling days. Should be a wonderful adventure for our family! I know lots of you out there are homeschooling as well – I would love for you to share a favorite resource or point me in the direction of homeschooling blogs you love (even your own!). 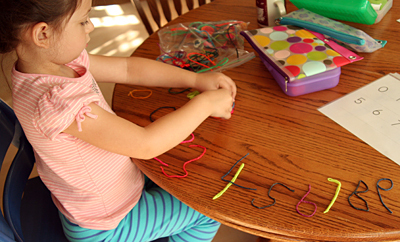 Make your own functional print together – scribbles are great! At the beginning of the school year, I volunteered to be the music docent for Natalie’s Kindergarten class. Once a week, we sing, move, and play instruments together for 30 minutes. One of the objectives for the year is recognizing some common orchestra instruments by sight and sound. The kids are so interested in learning about the orchestra and listening to classical pieces. They are starting to identify individual instruments while listening to the music, which is so neat! I gathered and sampled a lot of resources while prepping for my lessons, so I thought I would share them with you! These sites have interactive features and instrument sound samples for kids. 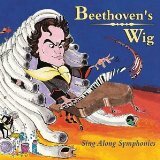 If you haven’t tried the Beethoven’s Wig CDs, you should! We borrow them from the library all the time – I probably should break down and buy a set of our own. They have funny lyrics set to well-known classical pieces – my girls and all the Kindergarteners *adore* them! My girls love to get out their musical instruments and dance or march around the room to orchestra music. We talk about making a steady beat, whether the tempo is fast or slow, and name as many instruments as we can. They also like to take turns being the conductor! Any little instrument and orchestra enthusiasts at your house? I’d love to hear your favorites ideas and resources, too!